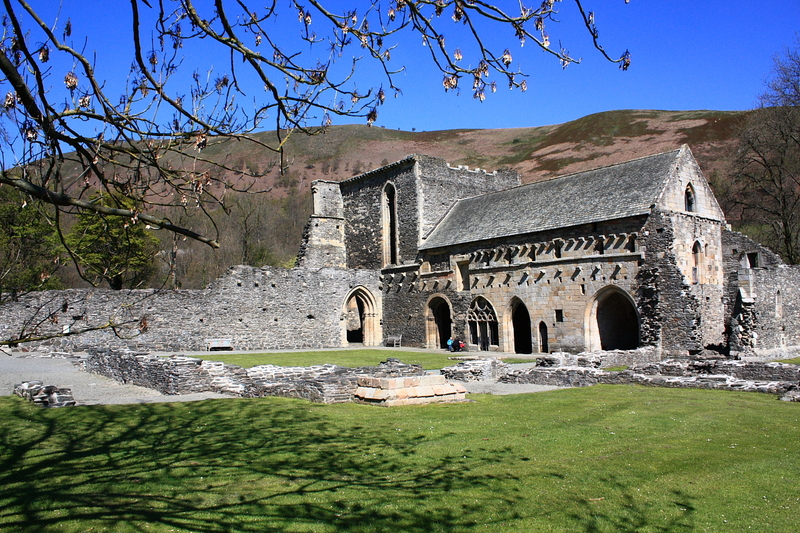 Above: Valle Crucis Abbey viewed from the west. 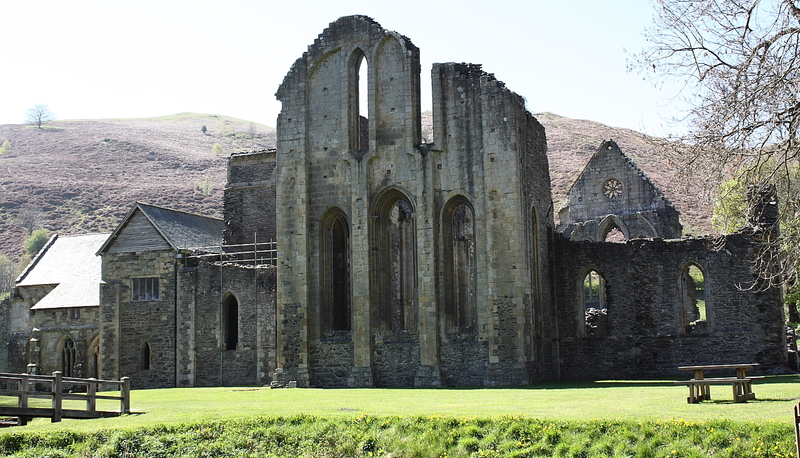 Valle Crucis (Valley of the Cross) takes its name from from Eliseg's Pillar nearby, which would already have stood for nearly four centuries when the abbey was established in 1201. 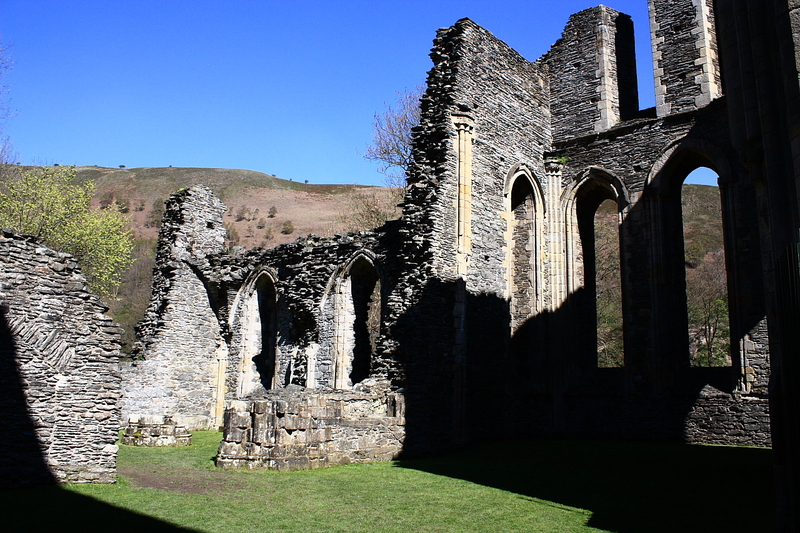 The new foundation was a Cistercian house, a 'daughter' of Strata Marcella, near Welshpool; its patron was Madog ap Gruffudd Maelor, ruler of northern Powys. So that the abbey could enjoy solitude required by the order, the existing settlement of Llangwestl was removed to Stansty, north-west of Wrexham. The layout of the abbey largely followed the standard Cistercian plan. 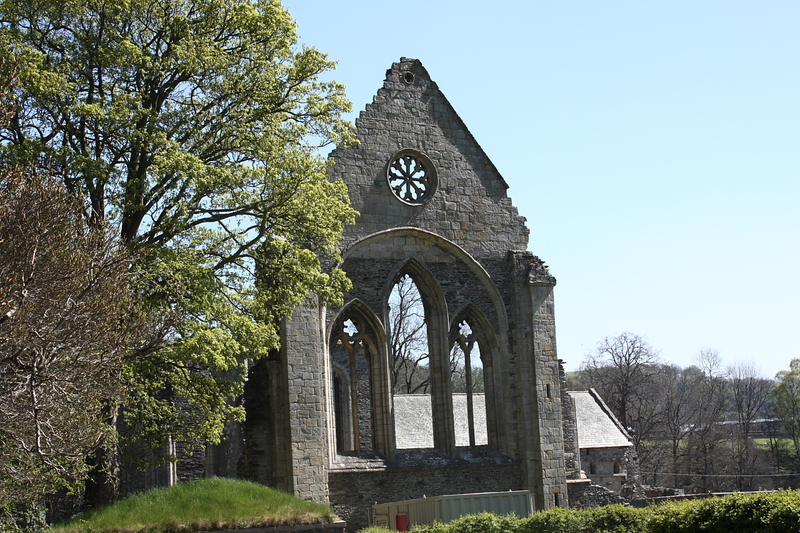 The abbey church accommodated both the choir monks, who spent their time in prayer and contemplation, and the lay brethren who undertook more mundane duties, such as agricultural work, enabling the community, at least in its early years, to remain largely self-sufficient. The monks observed their daily offices in the choir, beneath the crossing of the church, separated by a screen from the lay brethren who worshipped in the nave. The choir monks would also say mass individually in the transept chapels at other times. 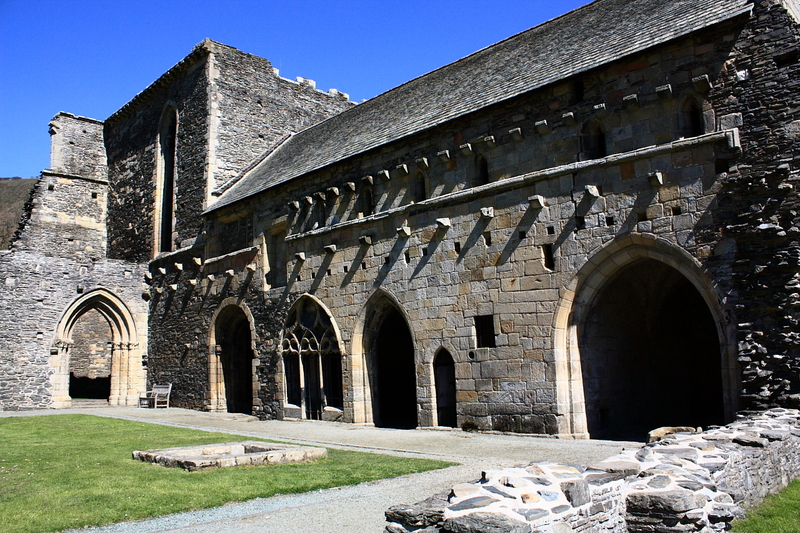 The 40 or so lay brethren would have been accommodated in the range to the west of the cloister. This has undergone later alterations (the number of lay brethren declined sharply in the 14th century, partly due to the Black Death in 1349), but would originally have contained a cellar at the north end, a central day room and a refectory on the south, now lost. Upstairs would have been a dormitory similar to the choir monks' in the eastern range opposite. 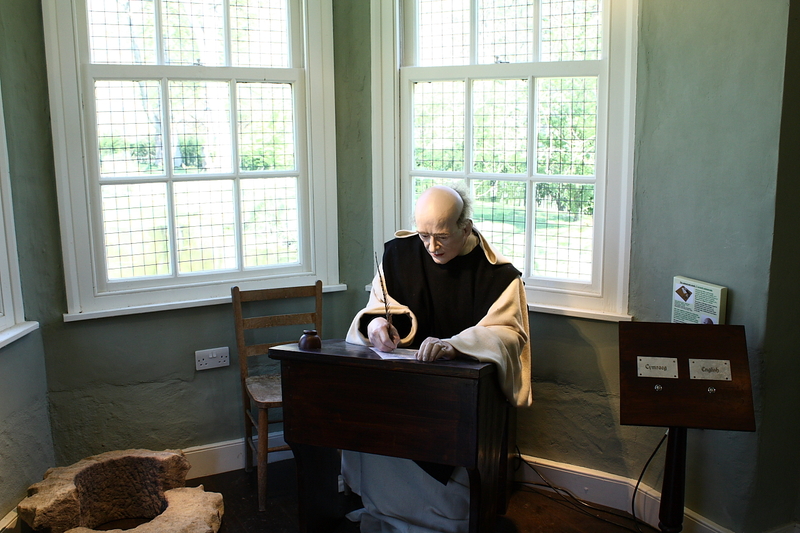 The refectory, which would had shared the adjoining kitchen with the choir monks' refectory beyond it in the south range, was later replaced by an office for the cellarer. 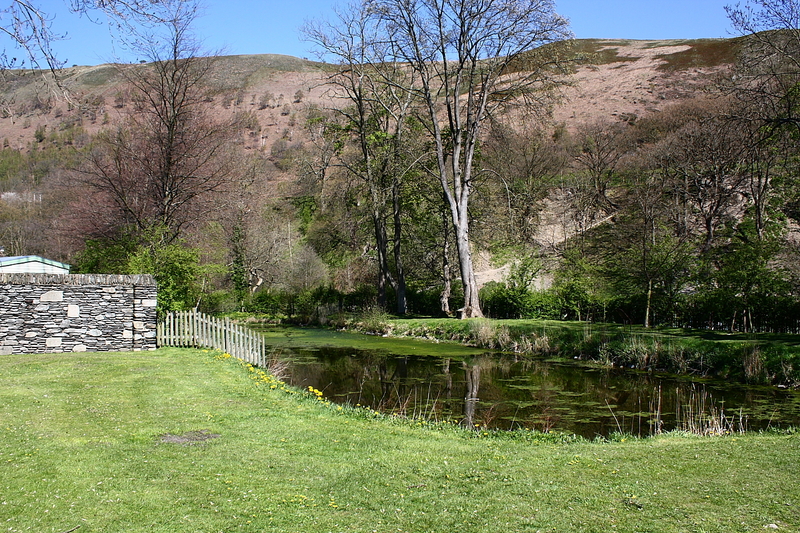 Below (2): the east end of the church and the monastic fishpond. The choir monks' accommodations, built for about 20, lay on the east and south of the cloister. Access from the church would have been by a day stair, later removed, and a night stair, leading directly to the first-floor dormitory. Below this, next to the church, lay the sacristy, housing vestments and plate for the services; alongside this was the chapter house, with a book-cupboard in the thickness of the wall. Daily meetings of the choir monks took place here; a chapter from the rule of the order would be read and business discussed. 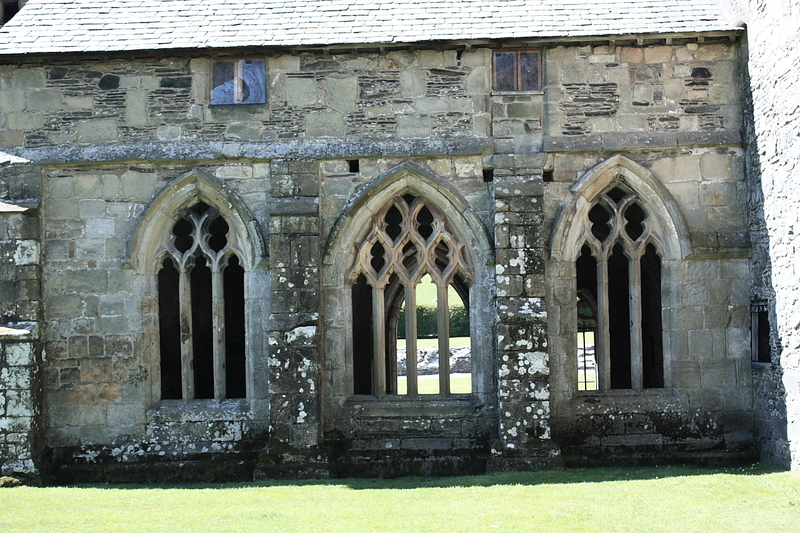 The normal Cistercian plan would have continued with a parlour, and possibly accommodation for novices, but at Valle Crucis a passage ran south of the chapter house (right), perhaps to a separate infirmary; beyond it the range finishes with the lower level of the latrine block serving the dormitory above. Traces of a longer range beneath the present later 14th or early 15th century plan, suggest that the missing rooms were relocated in the now under-used accommodation on the west. 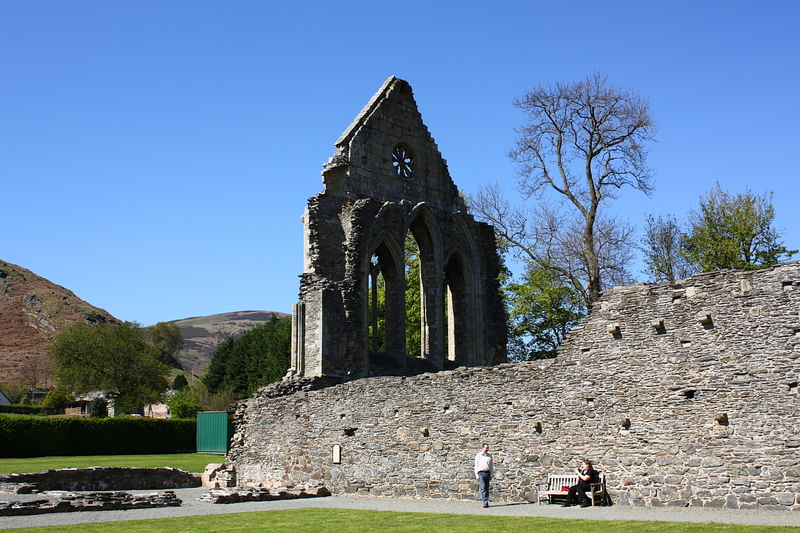 The abbey suffered a serious fire soon after its founder's death in 1236; traces of burning are visible on the lower stonework of the church and the south range. 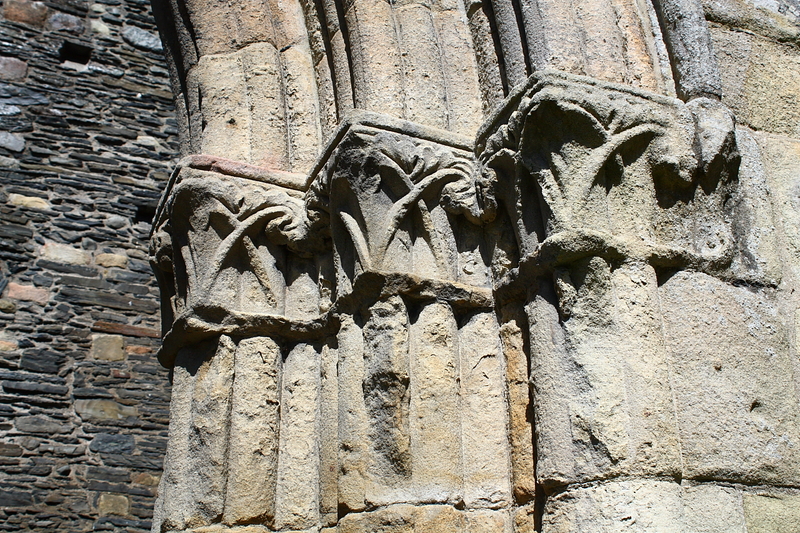 Substantial rebuilding (distinguished by putlog holes for the ends of the wooden scaffolding) had already taken place when the abbey found itself on the losing side during Edward I's Welsh campaigns in 1276-7 and 1282-3, although subsequent compensation enabled it to flourish for much of the following century. 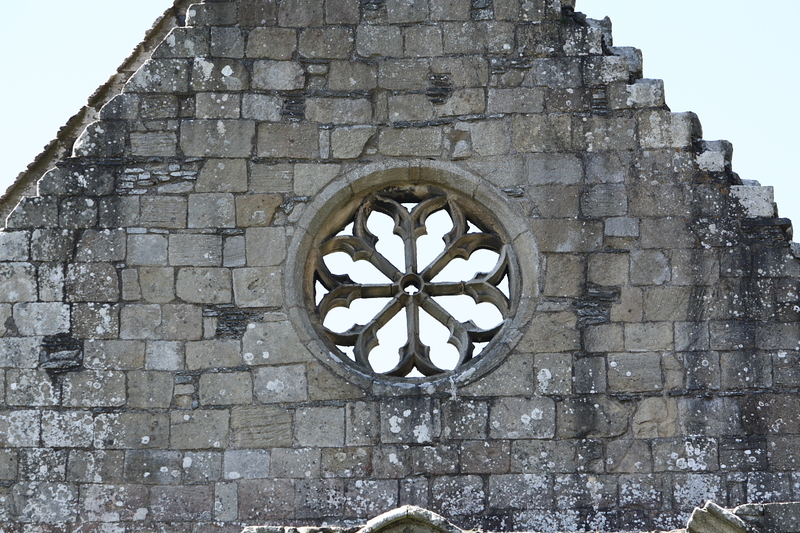 Repairs to the church, notably the reconstruction of the magnificent western gable end, commemorated by the inscription above the rose window, were carried out under Abbot Adam in the early 14th century. Whether this was restoration of damage in the Welsh campaigns or in some later episode is not clear. After the Black Death, numbers declined, not only of lay brethren but probably of choir monks; late in the century the screen behind the choir stalls was moved eastwards from its original position one bay into the nave to the crossing arch where it can be seen today. It was perhaps after the alleged damage during the early 15th-century Glyndwr rising that the east range rebuilding was completed. The superb vaulted chapter house is an especially well preserved feature and dates from this time. 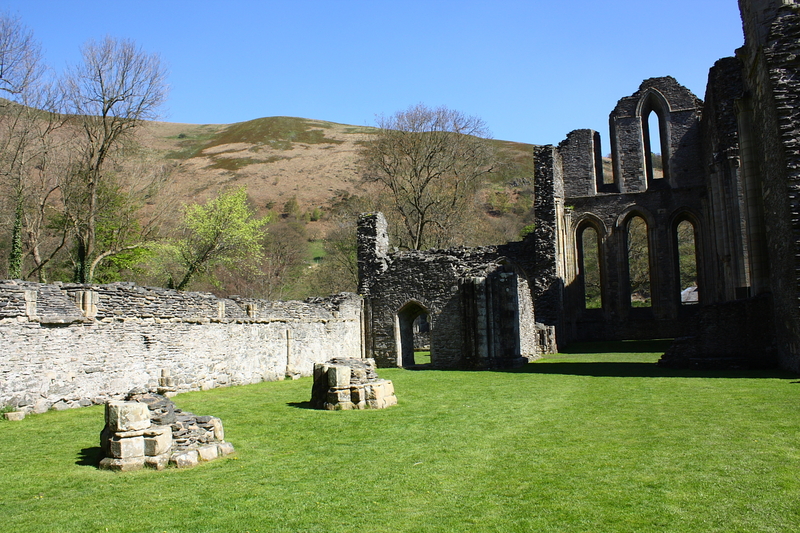 The wealth of the abbey certainly increased, and by the end of the century poets praised the hospitality of its abbots. About this time, part of the first-floor east range dormitory, together with an adjoining room, was made into a comfortable suite for the abbot, while the rest was converted into lodgings for the abbots guests. The few remaining monks may now have slept in the west range, in accommodation no longer required for lay brethren. 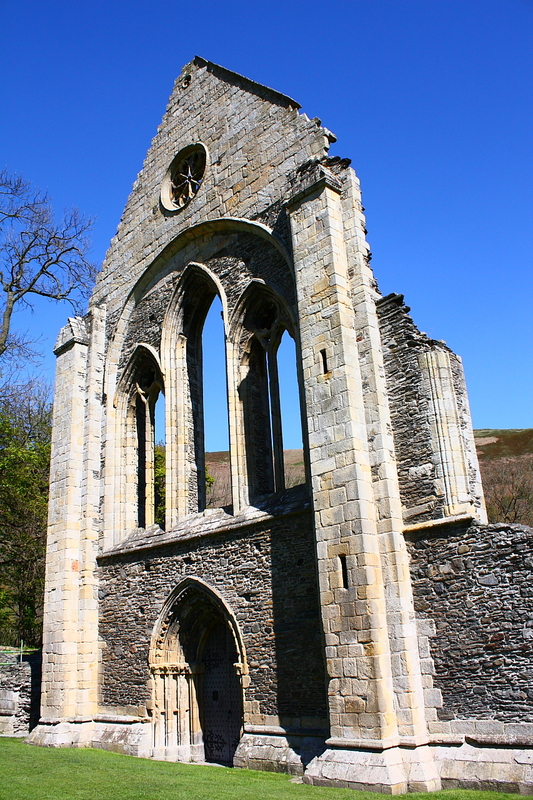 Additional photographs of Valle Crucis Abbey. Below: the east end of the church viewed from the nave. Below (2): two close up views of the abbey's beautiful west front. 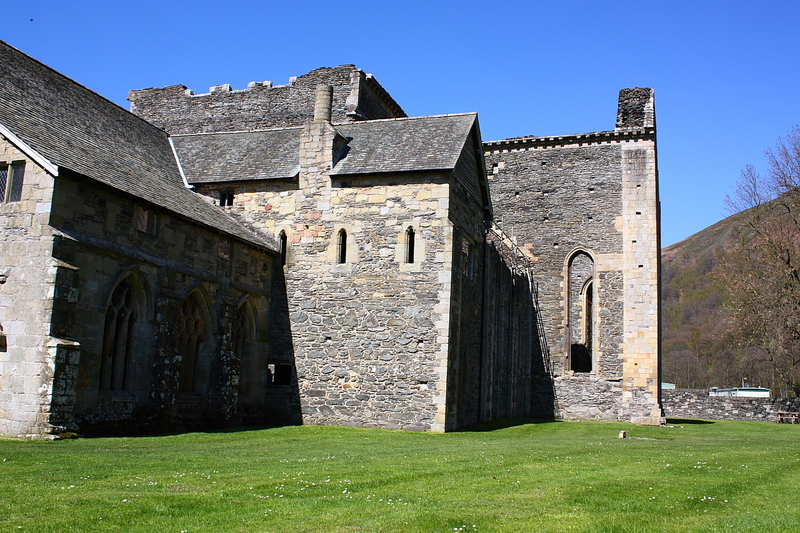 Below: view of the Chapter House along the east range. 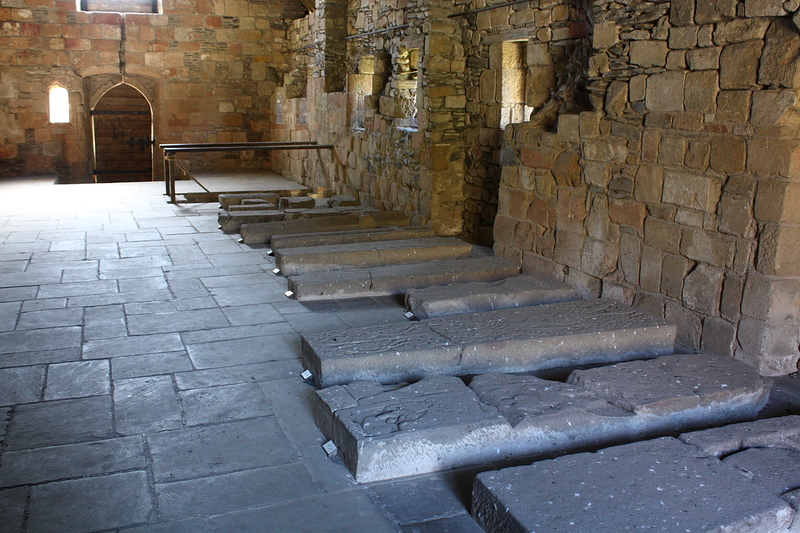 Below: view of the dormitory and its fine selection of sculptured grave slabs. 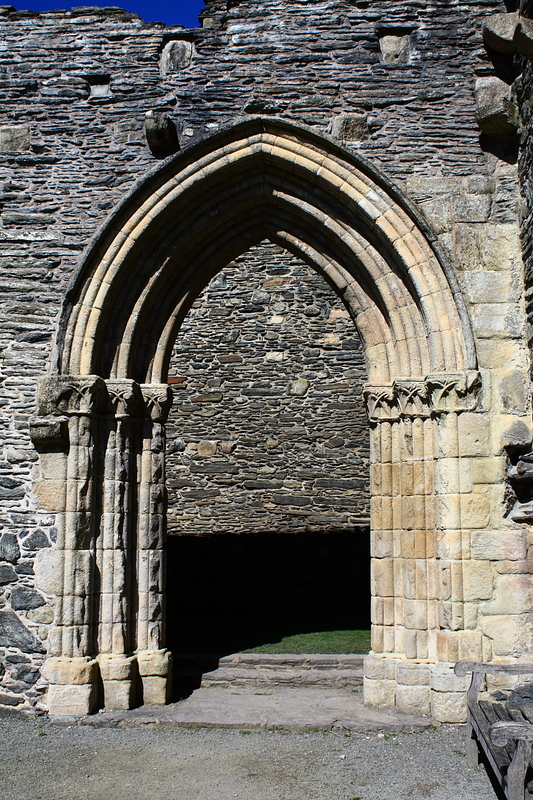 Below: view of the doorway leading from the Nave to the Cloister. Below: view from the Chapter House towards the Lay Brother's Day Room & Cellar. 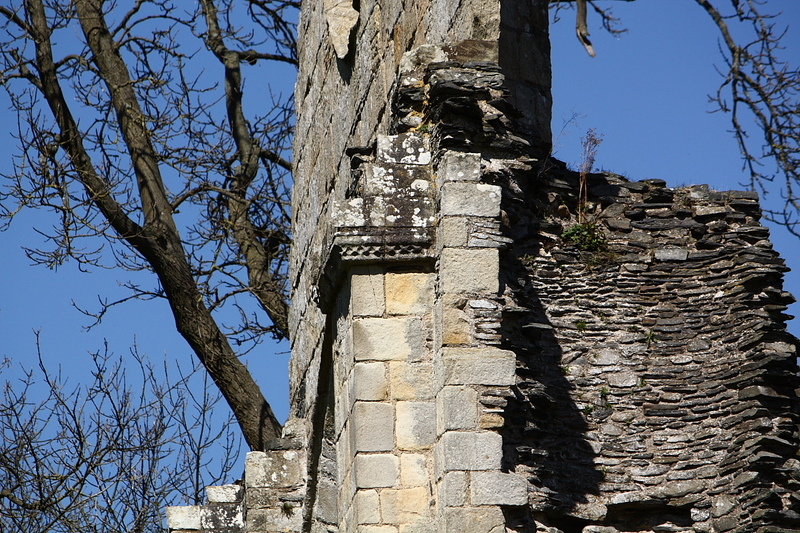 Below (2): two examples of fine surviving detail at Valle Crucis Abbey.